It was an honour to be invited to paint for the Master the Walls program run by The Wall Station. Prior to painting we ran a ‘Birdo Bonanza Sketch’ workshop with students from years 7 to 12 and I gave a short artist talk on the day to day life of freelancing art full time. The design we painted was inspired by an exisiting illustration I had which showed a Superb Blue Fairy Wren perched on a book. 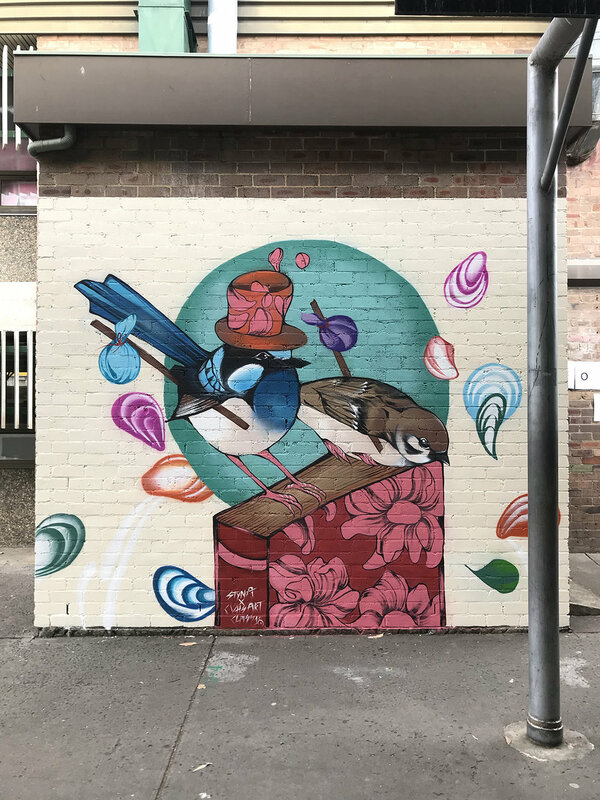 We included a friend for the character (the house sparrow) and together painted a story of two birds seeking residence on the walls of Canley Vale High school basketball courts. The piece is both figurative and literal in the sense that I used nonsensical elements like top hats and floatings petals as well as the book to represent youth and knowledge (and to study hard!) But I believe the essence of the piece is the sweet spot between knowledge and the imagination and how important it is (especially during schooling years) to nurture one’s imagination. The Master The Walls Program is a school mural program for low socio economic high schools who could not otherwise afford to have a street artist visit the school. The Program has been funded by The Matana Foundation for Young People, whose vision is to create a more just society by giving every young person in Australia an equal opportunity to access the skills to negotiate life’s journey. Thanks to Jacinta Fintan, director of The Wall Station for giving me to opportunity to paint! A big thanks also to Angela and Isobel from Canley Vale High Arts faculty for their hospitality and kindness.